Click here for Valentines Day! Allow me to introduce myself. 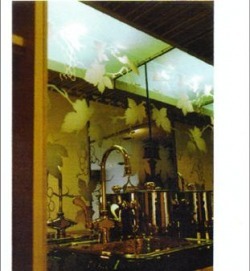 My name is Robert J. Buffone I have been custom etching plate glass, mirrors and crystal products since 1975. My hobby grew into a business that I enjoy so much that I am still operating today. I also represent one of the largest promotional products suppliers and can work with you to find that special gift whether you are a novice, casual or connoisseur wine drinker, everyone wants to own that special something that is personally unique to only them. The wine specialty items are priced not decorated and you can purchase for the price shown. We can have these items decorated for an extra charge. Forward your art work and we would be happy to quote the decorated price. Thank you for visiting Tasa Specialty Glass. I look forward to hearing from you. Contact us directly by filling out the form below. Thank you for viewing our custom products at Tasa Specialty Glass.